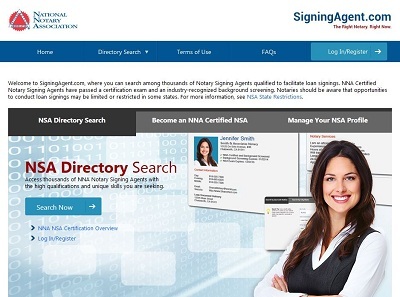 One of the benefits of completing the NNA’s Signing Agent Certification course is a complimentary listing on the SigningAgent.com directory — which is being used by many national signing services and title companies to find qualified NSAs. To activate your SigningAgent.com profile, just follow these steps. Select “Login” at the top of the page to sign in to your online profile. Your “My NNA” page will appear once you log in. Select “My Signing Agent Profile” from the menu on the left side of the page. Once you’ve finished creating your profile, activate it by checking the box “Show my Listing on SigningAgent.com.” It can be found under the “Edit Signing Agent Profile” or “Profile Details” menus. Then click the “Save” button at the bottom of the page. Any Notary who completes the NNA’s Signing Agent Certification course and background screening automatically receives a listing — NNA membership is not mandatory. Posting and updating your listing can help you network with a wide variety of companies — such BancServ, MortgageDocs and Nations Direct — who use SigningAgent.com to find qualified local Notaries for loan signing assignments. Here we've compiled a list of companies that use SigningAgent.com. If you need assistance with your SigningAgent.com profile or are interested in more information about NNA Signing Agent Certification and background screening, contact our Customer Care Team at 1 (800) US NOTARY (1-800-876-6827).